Fig. (1). 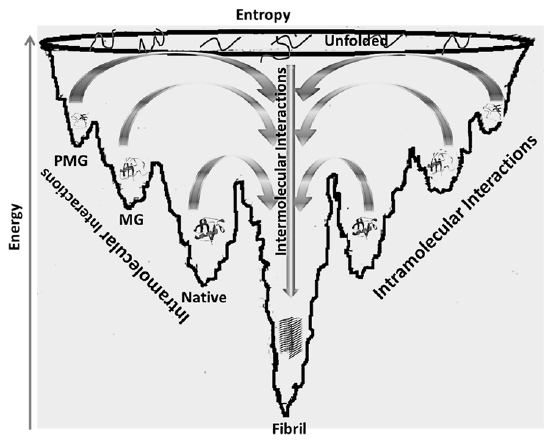 A Schematic of native and fibril states formation. It highlights the structural and functional differences of the two states. Fig. 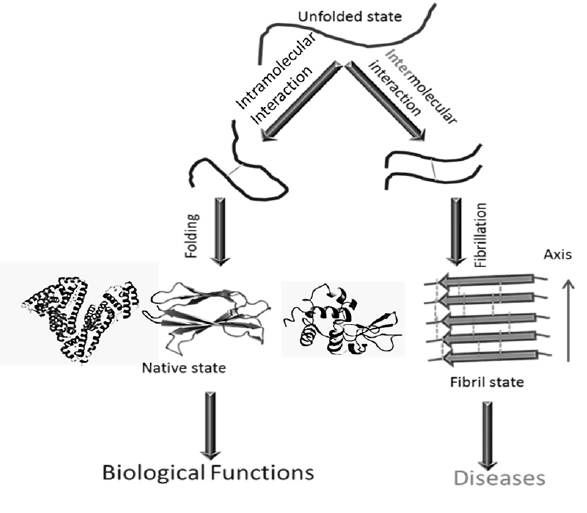 (2) Unification of energy landscape for the formation of native and fibril states of proteins. From a critical analysis of the literature, researchers at UM-DAE Centre for Excellence in Basic Sciences (CEBS), Indiafound that all the folding equilibrium states such as native like state, molten globule, premolten globule or unstructured state have a tendency to associate with other molecules of similar structure to form the fibril state. They also noticed that the amyloid state is the most stable thermodynamic state present in the energy landscape, whereas native state is a metastable state. On the basis of these analyses, they proposed that exposure of relevant peptide sequences/nucleating sites is the requirement for amyloid fibril formation. They also hypothesized that the native State is just a 'fortunate trap' in the Journey of a protein to its destination, the fibrillar state.